ImagePRO-II is an advanced high performance all-in-one video scaler, scan converter, switcher and transcoder converting any input signal format to any output format. 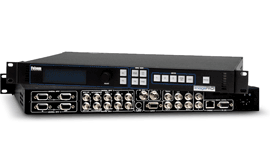 ImagePRO-II supports Universal Analog, DVI single and dual link, HDMI, DisplayPort and SD/HD/3G SDI signal formats. Loop-through outputs are provided for the Analog, DVI and SDI input and genlock signals. With features like HDCP and EDID management, USB back up and restore, multiple video effects and web page interface, ImagePRO-II is the most advanced and flexible signal processor in the industry. The ImagePRO-HD is a high-performance video scaler, scan converter, switcher and transcoder all rolled into one.